[FM19] Newcastle United - club for sale, takeover close? 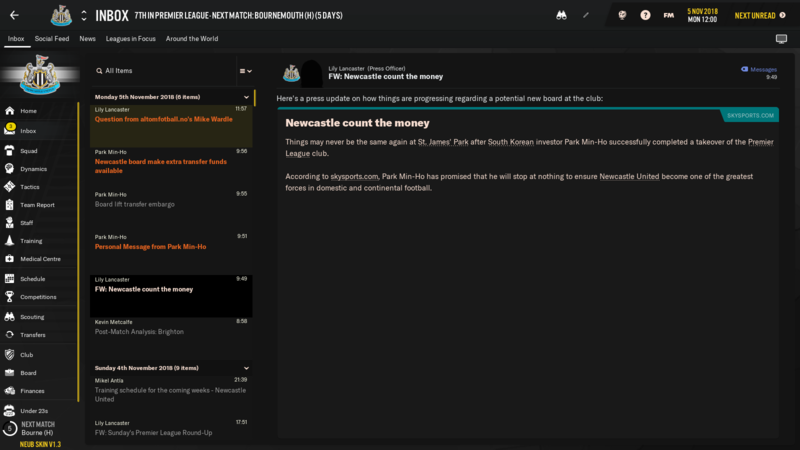 That was the quickest takeover ever (Mike Ashley take note) and my first ever tycoon takeover on any version of FM. Any chance of uploading that save? FFS! Went into February of 2nd season 8th, in the 5th round of the FA cup and in pretty good nick all in all. Played Liverpool, Arsenal and Man City in a week, all away from home and it just imploded. Lost 7-2 at Anfield, 6-0 at The Emirates and 5-1 at Etihad! I could not do anything to stop them - wow stunned. 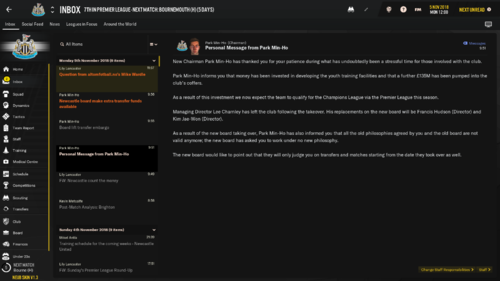 Picked up what could be the best signing of my entire FM career to date. 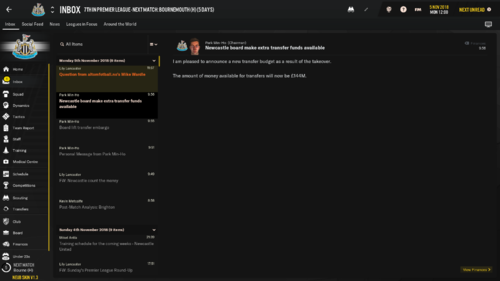 Scouts came back on told me that Joao Felix had requested to leave Benfica and was listed for £37m, I slapped a bid in quicker than you Jordan Pickford can fumble the ball and hey presto - he's a mag! One of the drawbacks and pluses of the game that, that the AI doesn't even contemplate transfers between windows. Almost 3 months into the save, and no takeover attempt so far...What's up with that? Anyways, it's going okay... we started off by beating Cardiff 3-0, then losing 0-1 to Arsenal, drawing 2-2 at home to Crystal Palace before beating Everton 3-2 away. We also defeated Stoke 2-0 to advance to the third round of the Carabao Cup. Next league game is away to Man Utd. I'm not expecting anything from that. Got a little bored of my first winter transfer save after about 2 1/2 seasons. Just mired in the mid-table battle while to top teams spend billions - sounds sadly familiar. So... it happened. They now want CL ball, and I know that's impossible. So I'll probably get fired at the end of the season, which makes me wonder if the save if worth continuing. Yeah, I'm gonna delete the save. It's way too unrealistic. 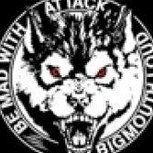 New owners, however ambitious, should at least look at the mathematically opportunity in the season they take over, before they set the new goals. Or you should at least be able to talk to them about their unrealistic goals. Once upon a time there was a football club. Then there was a fat Home County frying pan and then there was a fire. And everybody jumped into the fire. 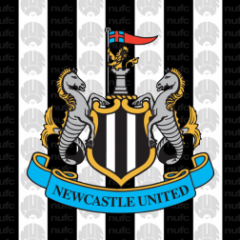 I have to have one good NUFC save each year and the only Newcastle save I have attempted on FM19 I got a takeover wanting champions league in the first season then got sacked so hopefully that dosen't happen again and I can finally win something as my team Newcastle. I have Invested most the budget at the start into my under 23s and under 18s so they are now stacked with potential which will hopefully pay off in the long run. 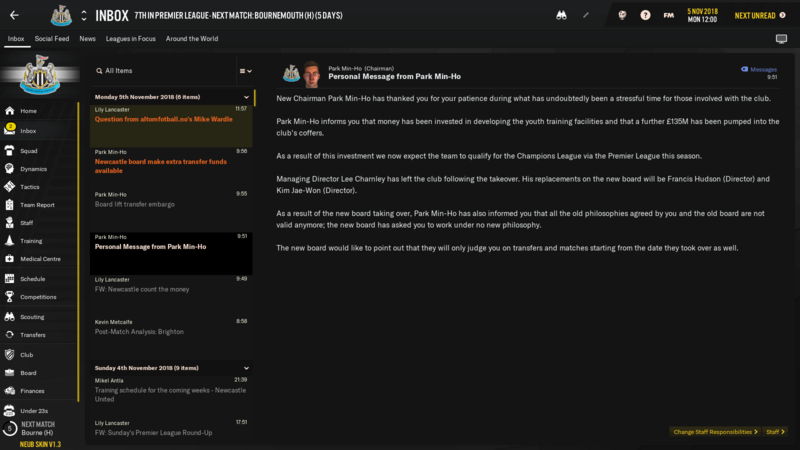 I shifted the players I'm not keen on out to raise funds like Ritchie, Dummett, Joselu etc and I got Max Aarons and Ben Pearson in too as they seemed two of the best players in the championship.